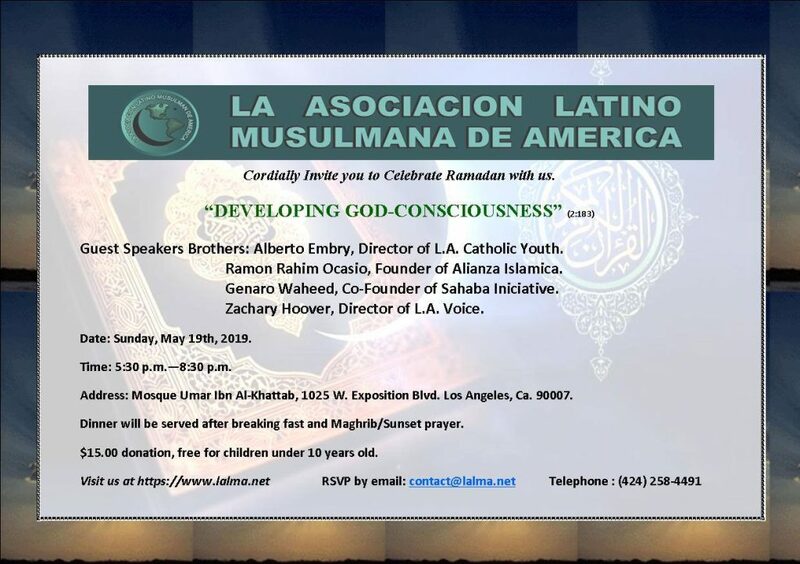 LALMA’s annual Ramadan Iftar in Los Angeles on May 19, 2019. This 1985 article in Islamic Horizons highlights a presentation on Latinx people in Islam at the Museo del Barrio in East Harlem. At this time, a diverse Latino-led community was beginning in the Barrio known as Alianza Islamica, which started in 1987 with a journal of the same name. The founders made claim to Islam as part of the heritage of Latinx people. By the early 1990s, members were visible members of their neighborhood, hosting Islamic classes at their Lexington Ave mosque, providing services for food insecurity and offering funeral services for Muslim HIV/AIDS victims, a novelty at the time. Published by the first iteration of the organization Alianza Islamica of the mid-80s, it was the first bi-lingual publication of its kind. The journal Alianza Islamica was a joint effort with the Bismi Rabbik Foundation in Chicago. The second iteration of Alianza Islamica as an organization, which lasted from the late 80s to the early 2000s, is the one more popularly associated with the name. Created with the crude desktop publishing tools of the day, the newsletter Somos… was Alianza Islamica’s flagship publication. The ellipsis in the name was meant to evoke a literal journey of gradual self-revelation that would, in time, make clear who we were as Latino Muslims and our mission in El Barrio. This presentation is a comprehensive look at resistance movements from the Sixties through to the present day. It mainly focuses on the roots of resistance and how they influenced early indigenous Muslim communities. Rahim Ocasio presented it at Darul Hijra in Northern Virginia about 2008/2009 as part of a youth program. The video below documents a landmark event in the history of El Barrio (Spanish Harlem) and the Latino Muslim story in the United States. It was Alianza Islamica’s attempt to publicly showcase an expression of Muslim culture that was distinctly Latino and accurately reflected our contemporary cultural reality: sights, sounds, music, songs, verse, and food, the latter with an indispensable assist from our mothers. The result: a festive event novel yet familiar to both Muslims and non-Muslims alike.